Haifa's main tourist attraction is the Bahá'í World Centre, with the golden-domed Shrine of the Báb and the surrounding gardens. Between 2005 and 2006, 86,037 people visited the shrine. The restored German Colony, founded by the Templars, Stella Maris and Elijah's Cave also draw many tourists. Haifa has over a dozen museums. The most popular museum is the Israel National Museum of Science, Technology, and Space, which recorded almost 150,000 visitors in 2004. The Tikotin Museum of Japanese Art, located within walking distance of the Wikimania venue, is the only museum in the Middle East dedicated solely to Japanese art. Other museums in Haifa include the Museum of Prehistory, the National Maritime Museum and Haifa City Museum, the Hecht Museum, the Dagon Archaeological Museum, the Railway Museum, the Clandestine Immigration and Navy Museum, the Israeli Oil Industry Museum, and Mane Katz Museum. The gardens and world centre on Mount Carmel's northern slope are a must-see for any visitor to Haifa. Comprising the golden-domed Shrine of the Báb, terraced gardens and administrative buildings, the World Centre is the holiest site of pilgrimage for the members of the Bahá'í Faith, as well as the faith's central administrative center. The gardens are stunning and well worth visiting if you are in Haifa. The tours are free however reservation is required. Between 2005 and 2006, 86,037 visited the golden-domed Shrine of the Báb. The Shrine of the Báb is the location where the remains of the Báb, founder of Bábism and forerunner of Bahá'u'lláh in the Bahá'í Faith, have been laid to rest; it is considered to be the second holiest place on Earth for Bahá'ís, after the Shrine of Bahá'u'lláh in Acre. Its precise location on Mount Carmel was designated by Bahá'u'lláh himself to his eldest son, `Abdu'l-Bahá, in 1891. `Abdu'l-Bahá planned the structure, which was designed and completed several years later by his grandson, Shoghi Effendi. Elijah is considered a prophet by both Judaism and Islam. The Carmelites have a tradition that they were founded by Elijah at this time. According to tradition Elijah lived in a cave on Mt. Carmel during the reign of King Ahab. The site itself may disappoint many tourists. One enjoyable and scenic option for good walkers is to walk down to the cave from Stella Maris (monastery) at the top of Mt. Carmel. Stella Maris is the location of French Carmelite church, monastery and hospice. This is the founding place of the Carmelite Order, a religious order of the Roman Catholic Church. Located atop Mount Carmel, there is a hiking trail connecting it to the Cave of Elijah down mountain. In the 12th century, during the Crusader rule of the region, groups of religious hermits began to inhabit the caves of this area in imitation of Elijah the Prophet. Within a few decades, these monastic hermits left the troubled Holy Land and the Carmelite order spread throughout Europe. At the end of St. Louis’ first crusade to the Holy Land in 1254, he took six Carmelites back to France with him and the Order had begun to found houses throughout Europe from 1238 onwards. However, when Acre fell in 1291, they were forced to withdraw by Mamluks. In 1631 the Discalced branch of the Order returned to the Holy Land, led by the Venerable Father Prosper. He had a small monastery constructed on the promontory at Mount Carmel, close to the lighthouse, and the friars lived there until 1761, when Dhaher al-Omar, the then effectively independent ruler of Galilee, ordered them to vacate the site and demolished the monastery. The Order then moved to the present location. The church was seriously damaged in Napoleon’s 1799 campaign. Sick and wounded French soldiers were accommodated in the monastery, and when Napoleon withdrew, the Turks slaughtered them and drove out the monks. In 1821, Abdallah Pasha of Acre ordered the ruined church to be totally destroyed, so that it could not serve as a fort for his enemies, while he attacked Jerusalem. The current church and monastery, built under the orders of Brother Cassini of the Order, was opened in 1836. German Colony, Centered around Ben Gurion Boulevard, was built on land purchased in 1868 by members of German Templar Society (not to be confused with the Knights of the Templars) where they planned to build an agricultural community in the Holy Land. Many of the original Templar houses have preserved and undergone restoration in recent years. Now the main street of the former colony (Ben Gurion Boulevard) is a promenade, with many restaurants and coffee shops. The City History Museum and the local Tourist Board are located at the German Colony. Israel's National Museum of Science, Technology and Space is housed in two historic landmark buildings in mid-town Haifa. Designed, at the turn of the century, by renowned German Jewish architect, Alexander Baerwald, these were home to the Technion – Israel Institute of Technology, Israel’s first institution of higher education. The museum has approximately 200,000 visitors annually. The Museum's collection is one of the largest archeology collections in Israel. It is composed of various sub-collections, which all convey man's connection to the sea: underwater archeology; maritime art; maritime mythology; ancient anchors; Greco-Roman coins; scientific instruments; storage jars for maritime trade; cartography and prints. The Numismatic Collection contains over a thousand coins decorated with maritime themes: ships, anchors, ports, pagan gods, fish, and seashells. National Maritime Museum, 198 Allenby Street, Tel: +972-4-8536622. The Hecht Museum features archaeological exhibits and an art wing with 19th and 20th century painting and sculpture, including works by Corot, Manet, Monet, Pissarro, Van-Gogh, Soutine and Modigliani. The Mane-Katz museum is located on Yaffe Nof Street, within walking distance of the venue. Mane-Katz left his paintings and extensive personal collection of Jewish ethnography to the city of Haifa, Israel. Four years before his death, the mayor of Haifa, Abba Hushi, provided him with a building on Mt. Carmel to house his work, which became the Mane-Katz Museum. The exhibit includes Mane-Katz's oils, showing a progressive change in style over the years, a signed portrait of the artist by Picasso dated 1932 and a large collection of Jewish ritual objects. The Tikotin museum was founded in the year 1959, at the joint initiative of Felix Tikotin, a known collector of Japanese art and the Haifa municipality. The museum present rotating exhibitions of old and modern Japanese art. The Museum presents a variety of events concerning the arts and culture of Japan. These include lectures, films, the tea ceremony, festivals and special celebrations, many of which are held in the Raphael Angel Auditorium. The Haifa Zoo and Botanical Gardens are located in Gan Haem, within walking distance of the venue, near the Carmelit station and across the street from the Dan Panorama and Nof hotels. Saloon coach No. 98, used for VIP transport. It was built in England in 1922 and has been used by among others Emperor Haile Selassie of Ethiopia, Queen Elizabeth of Belgium and Prime Minister Winston Churchill. Ambulance coach No. 4720 was used during World War I by the Royal Army for transport of wounded soldiers. It was built in 1893 in Belgium for the Egyptian National Railways. Hedjaz Railway 0-6-0 tank locomotive. The Druze Villages are located on the top of Mt. Carmel, 25 minutes by car from the venue. The tourist-oriented bazaar has inexpensive shops and excellent Mid-Eastern restaurants. Daliyat el-Carmel is the largest and southernmost Druze town in Israel, located in the heart of the Carmel National Park, southeast of Haifa. Established 400 years ago, Daliyat el-Carmel has a population of 13,000 Druze residents. Large market in the center of the town sells traditional Druze and Arab products and draws tourists from Israel and from abroad. Ein Hod artists' colony, is a village 30 minutes ride by car from the venue, where over 90 artists and craftsmen have studios and exhibitions. 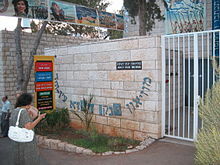 Ein Hod has 22 galleries, 14 art workshops, and 2 museums. Workshops include printing, sculpture, photography, silk screening, music (vocal), ceramics, mosaics, design, stained glass, lithography and blacksmiths. This page was last edited on 14 April 2011, at 11:19.